Win more business, have happier customers and enjoy easier days with my ready to use ‘On Time Delivery’ kit. Are your customers complaining about your on time delivery performance? Sometimes this seems impossible! Especially if you have a complex range of products, or a large volume of changing products. Do you get lots of phone calls from your customers, asking you where their orders are? Have your customers threatened to take their orders elsewhere, unless you start meeting delivery schedules? Does your team waste lots of time pushing orders around the business, against an ever-changing schedule? Do you want to stop being ‘out of control’? If you answered 'yes' to any of the above, and want a simpler and easier way to deliver on time, then this kit is for you. The ‘On-Time Delivery Kit’ has been created using expertise I have gained from years of helping my clients. 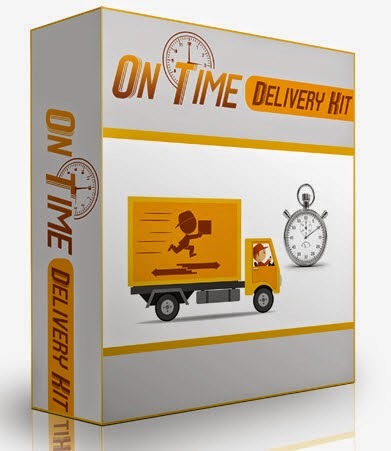 The kit provides a step-by-step guide to implementing the on-time delivery system. It is possible. I’ve done it myself! I can’t promise you overnight success. But I can give you the tools to improve the right things in your business. They experience shorter delivery / production lead times. Their ability to deliver on-time increases and becomes much more stable. Discipline and routine becomes more rooted in day-to-day operations. A great reduction in time, spent day-to-day fire-fighting, is quickly noticed and appreciated! Effective control of on-time delivery is established. Worksheets to fine-tune the system to meet your needs. Gain more sales from being a great supplier who delivers on time, every time! Many of my clients, who have used this same approach, have found that their existing customers start to place additional orders with them. My clients became the suppliers of choice, due to their dependability and ever improving speed and on time delivery performance levels. The kit includes forms, templates, worksheets, instructions and a presentation. Yes. If you don't think that the kit meets your needs then drop me an email (info@smartspeed.co.uk) and we'll arrange for a full refund. With the instructions that are included with the kit. How do I pay for the kit? If you click on the 'Purchase Now' button you will be taken to the checkout where you can pay for the kit and then download the files immediately. The files are in Microsoft Word primarily, with some PDF documents and a Microsoft PowerPoint file also. What kind of businesses is this kit suitable for? The kit applies to all business types, I haven't seen a business that can't use this approach. Please email your questions to info@smartspeed.co.uk and I'll get back to you as quickly as I can.